There are increasing challenges to attract and retain the right talent with a tight labor market. Employers will need to woo workers with everything from better onboarding to higher salaries to desirable benefits. Job candidates are making their demands known: A survey included in the Ajilon 2019 Salary Guide finds that of 454 respondents actively looking for new employment, 90% say the hiring process should take less than four weeks from application to onboarding. Ajilon, which conducted the Google Consumer Survey, finds that more than half (54%) say the process should take two weeks or less. That’s quite a contrast with what’s really happening in the application process. The average time it takes to hire a candidate is 43 days. That’s not the only shift that employers need to take into account when attracting and retaining workers. The Google survey finds that 31% of employed Millennials open to new opportunities. And they are much more likely to be influenced by recommendations about companies. In other words, what others have to say about an employer can determine if those young workers will be interested in jumping ship for new opportunities. More than half (58%) of employers plan to hand out pay raises to workers by the end of this year, and 45% say that starting salaries also will rise, finds a CareerBuilder survey. 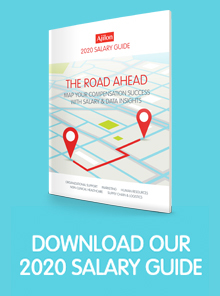 The Ajilon salary guide points out that offering better starting salaries buys companies time. Employers can use this to put other steps in place to retain new employees and more seasoned workers. Some companies also are using bonuses: Glassdoor reports that registered nurses have been offered $30,000 signing bonuses while Wal-Mart is offering $5,000 signing bonuses for experienced drivers. A Society for Human Resource Management survey finds that 34% of employers have boosted benefits in the last year, with 72% saying the reason is to retain workers while 58% say it’s to attract new workers. One of the benefits that increased “significantly” is parental leave, SHRM reports. Other popular benefits offered by employers include wellness resources and information (75%), retirement savings and planning (95%) and work-life benefits (70% offer telecommuting). “Nail your employer branding, and you’ll have top talent vying to get a foot in the door and work with you,” says Kristen Smalley, content manager of Randstad Canada. By focusing on your company’s values, goals and allowing employees to innovate, you will be more successful in offering an employee value proposition that resonates with applicants and current workers. More than half (55%) of 250 business executives in a variety of industries say that a company’s workplace technology is a deciding factor in taking a job. The survey, by Insight Enterprises Inc., says that 51% report that out-of-date or inadequate tech affects their ability to keep skilled employees. More than 60% of the respondents say employees want to be able to better tap into business data and half want to be able to choose their own mobile devices to use. With unemployment below 4%, employers will need to ensure that they’re being competitive in attracting and retaining talent. With efficient hiring practices, a focus on providing the pay and benefits that workers desire and making sure they offer a culture that is appealing, they will improve the odds of having the key talent they need.